Looking for the fastest transit time from Hong Kong to Rotterdam or perhaps you want to see which service provider offers the most comprehensive service coverage of the transpacific trade? Whether you are a carrier, freight forwarder or shipper, HKSG Media Group's Carrier Service Comparison (CSC) database provides these answers in just a few short clicks of your mouse button. We provide users with up-to-date service details for shipments out of China, for the top 20 shipping lines worldwide: K-Line, APL, China Shipping, CMA-CGM, Cosco, Emirates Shipping, Evergreen, Hamburg Sud, Hanjin, Hapag-Lloyd, Hyundai, Maersk, MOL, MSC, NYK, OOCL, RCL, Wan Hai, Yang Ming and ZIM. CSC provides an expedient way for shippers to check which carrier offers them the service they need, and for freight forwarders it provides their sales executives with an efficient tool for presenting their customers with informative presentations in a timely manner and with minimum fuss. Carriers will also find this service beneficial, as they will be able to see the competitiveness of their various service offerings and their comparative market coverage in a fast, simple and transparent manner. 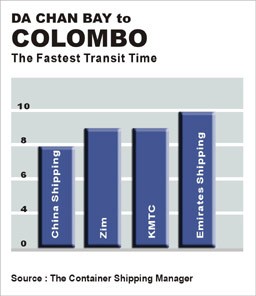 For the fastest transit time between Da Chan Bay and the Sri Lankan hub port of Colombo is China Shipping offers an 8-day service. China Shipping's AMX 2 service departs from Da Chan Bay every Thursday and arrives the following Friday. Both Zim and KMTC run on a 9-day schedule between the two ports. Zim's Far East Africa Express Line (FAX) service leaves the south China port every Saturday and arrives on the next Monday, while KMTC's RCI (RCL INDIA SERVICE) service departs from Da Chan Bay every Tuesday and arrives the following Thursday. Emirates Shipping offers weekly sailings on the route with Africa Far East Asia (AFA) services. The AFA service carries a 10-day transit time. For more information on these and other services, including transit times, closing times, S/I cutoff information and more log onto our Carrier Service Comparison (CSC) database today. Copyright © 2019 HKSG Group Media Ltd. All rights reserved.